Windows XP/Vista/7 - 32 or 64 bit. Microsoft Visio 2003/2007/2010 - 32 bit only, incompatible with 64 bit. Works with all Visio editions standard/professional/technical/academic. The Trial version does not include the following stencils: IEC Symbols 2, IEC Symbols 3, Electronic Symbols. They are only included in the Release version (standard and professional). Electra is a Microsoft Visio solution and requires Microsoft Visio to operate. It is strongly recommended that you install Visio before installing Electra. To install Visio, follow the instructions listed on the Visio documentation. Exit any applications you are running. Double click on the installer and run the installer program. Read the End User License Agreement and if you agree to the terms, click Accept. Click on the installation button to begin installing. 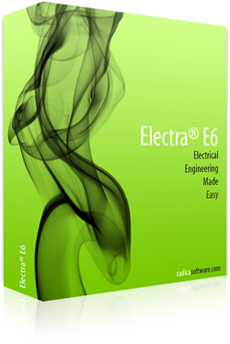 Start Electra by double clicking on New Electra Drawing.vst. 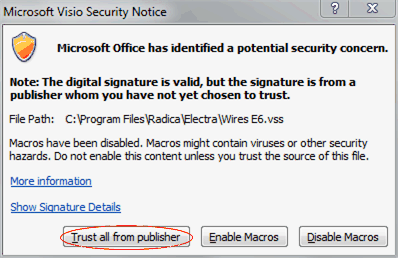 Visio will ask you about trusting us as a publisher, as listed below. Click “Trust all from publisher”. In Visio 2010, you will also be asked to turn on macros as listed below. Click on “Enable Macros”. The Trial Version is limited to 30 days, after which productivity tools will be disabled. You may not be warned about the expiry of the trial period. All drawings, information and data created using the Trial Version will still be usable even after expiry of trial period. Download a Trial version of Microsoft Visio 2010 here. Allows anyone to view Visio drawings and diagrams (created with Visio 5.0 through Visio 2010) inside their Microsoft Internet Explorer (versions 5 through 8) Web browser. Download here.